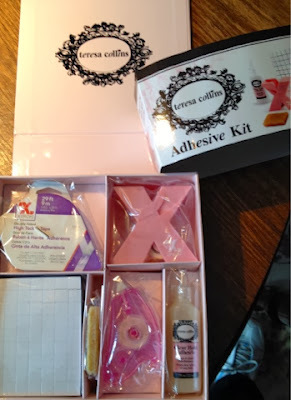 I am so happy that I took advantage of this Teresa Collins Adhesive Kit promotion with her pink design of Xyron adhesives. The box is adorable, and a future altered object for me. The little compartments contain 6 adhesives: disposable sticker maker (future altered item for me), 188 thick foam squares, disposable tape runner, double-sided High Tack Tape, Teresa Collins Clear Hold Adhesive, and the ever-useful adhesive eraser! I definitely will use this in my on-the-go art supply kit, as well as in my studio. Isn't it nice to feel that you made a good decision when spending money? Great promotion Teresa and Xyron!